Mifflin County’s Katelyn Knable, right, attempts to win the ball away from Altoona’s Darrian Berkheimer Saturday in Lewistown. LEWISTOWN — Jess Bickhart had a pair of solo goals in the second half, but she was playing catchup with Altoona’s Cassie Kyle, who had a hat trick in the opening half. That resulted in a 3-2 victory over Mifflin County for the Mountain Lions in a nonleague girls soccer game Saturday. The good news for the Huskies is that Allyssa Schnell stood tall in the net despite the goals, stopping 22 of 25 shots she faced. The JV game ended in a 1-1 tie with Gabi Clark scoring for the Huskies. 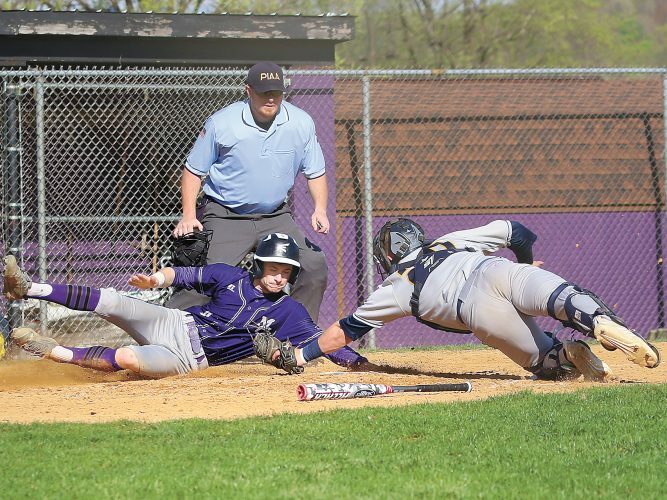 Mifflin County hosts Palmyra on Tuesday. A–Cassie Kyle (Darrian Berkheimer), 1:11; A–Kyle (Berkheimer), 14:21; A–Kyle, 30:50. MC–Jess Bickhart, 43:46; MC–Bickhart, 45:26. Shots: A 25-9. Saves: A-7; MC-22 (Allyssa Schnell). 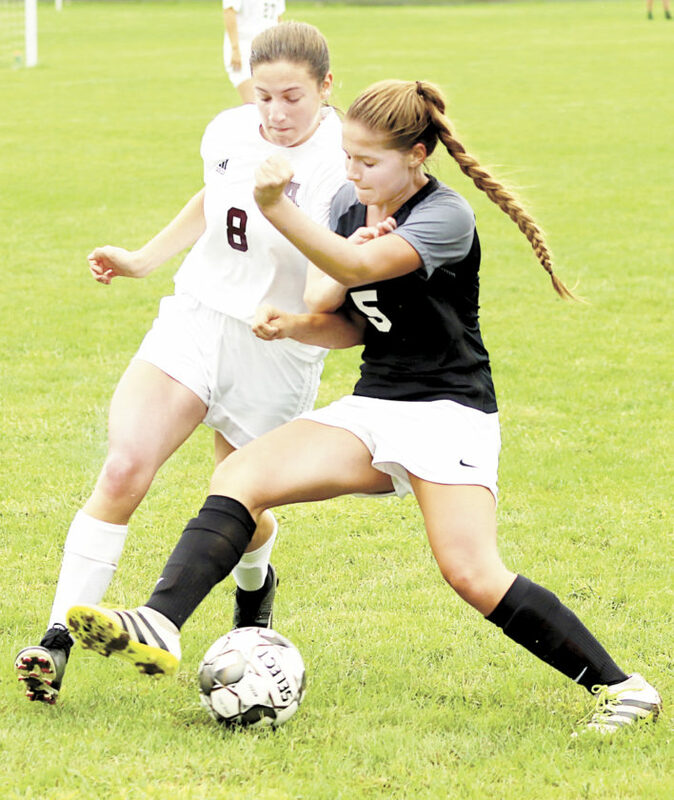 PORT ROYAL — Nylah Pannebaker scored twice as Juniata rattled off six unanswered goals against Moshannon Valley in a 6-1 win Saturday in nonleague girls soccer action. Moshannon Valley scored in the first 10 minutes but never found the back of the net again, being outshot 20-5. M–Emily Davis (Katie Tocimack), 31:25; J–Nylah Pannebaker (PK), 27:56; J–Pannebaker (Makenzie Beward). J–Hailey Kepner (Ashlyn Pannebaker); J–Beward, 8:49; J–Maci Kreider, 6:16; J–Emily Pannebaker (Beward). Shots: J 20-5. Corners: J 12-1. Saves: M-14 (Alicia Passmore); J-4 (Kali Foltz). Evan Eppley had two goals and an assist in a 5-0 win over Benton in the opening game. He had two more goals and a pair of helpers in an 11-0 romp over South Williamsport in the championship game. Carter Knepp outdid that, scoring a total of five goals with three assists on the day. Aidan Steininger also had multiple goals. The Mustangs also won the JV portion of the tournament, outscoring Jersey Shore (2-0) and South Williamsport (8-0). Midd-West (4-0, 2-0 Heartland Conference) hosts Central Columbia on Tuesday. MW–Nic Eppley (Carter Knepp), 1:38; MW–Knepp (Evan Eppley), 5:50; MW–E.Eppley, 6:07; MW–Knepp (Aidan Steininger), 10:28; MW–N.Eppley (Connor Erdley), 12:47; MW–Chase Strohecker (Knepp), 16:02; MW–E.Eppley (N.Eppley), 38:40. MW–Steininger (Knepp), 42:08; MW–Knepp (Angus Strohecker), 43:40; MW–Steininger (E.Eppley), 47:35; MW–Knepp (N.Eppley), 51:00. Shots: MW 22-1. Corners: MW 10-1. 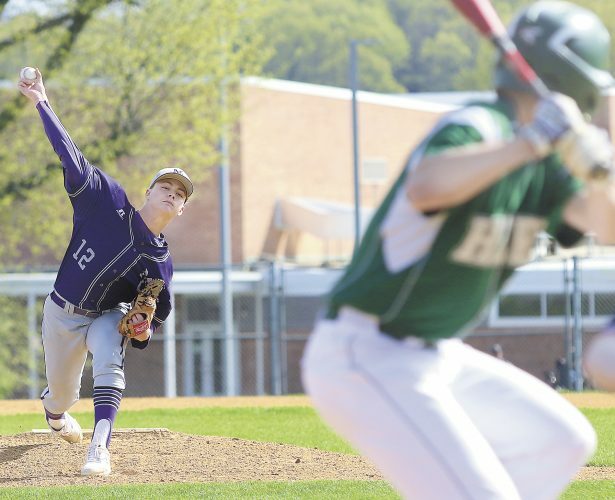 Saves: South Williamsport (Brock Weaver-8); Midd-West (Chase Roush-1). MW–Carter Knepp (Evan Eppley), 1:08; MW–Connor Erdley (Chase Strohecker), 16:14; MW–Stefan Leitzel (Strohecker), 30:05; MW–Eppley, 38:56. Shots: MW 19-1. Corners: MW 12-0. 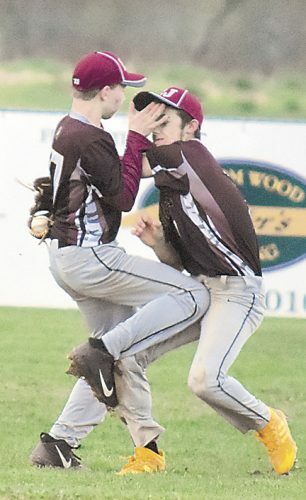 Saves: Benton (Jacob Martin-8); Midd-West (Chase Roush-1). WINGATE — Garrett Giedroc scored two goals and added an assist to lead Bald Eagle Area past Belleville Mennonite, 6-0, in boys soccer Saturday. The Thunder were held to four shots in the contest, in which the home team scored three goals in each half. Belleville Mennonite (0-4) travels to Sunbury Christian on Thursday. BEA–Nicholas Zink (Tim Durachko), 38:01; BEA–Garrett Giedroc, 33:06; BEA–Carter Stere (Giedroc),10:49. BEA–Anton Fatula, 36:36; Giedroc (Shane Eveleth),10:39; BEA–Seth Koch (Durachko), 2:36. Shots: BEA 13-4. Corners: BEA 9-0. Saves: BEA-4 (Conner Robinson); BMS-7 (Frankie Pannizzo). TYRONE — Three different players scored for Juniata as the Indians blanked Tyrone, 3-0, in a nonleague boys soccer game Saturday. The unbeaten Indians start the week with Halifax at home today. J–Barrett Walters, 37:20; J–Zack Hemond, 15:51. 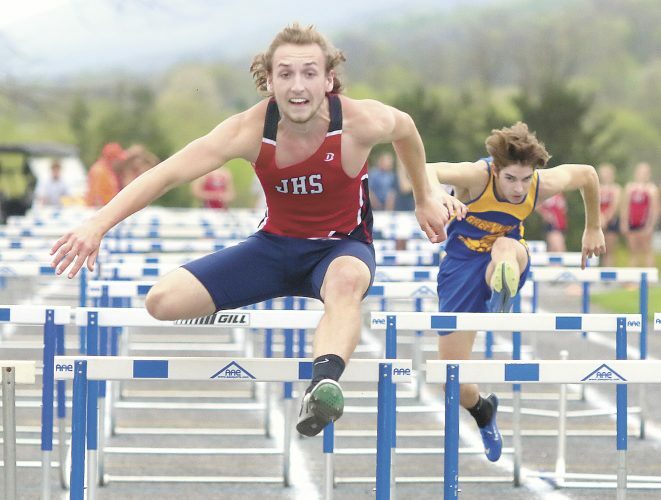 J–Tad Shellenberger (Zane Hazard), 30:50. ALTOONA — East Juniata avoided two losses out of its two games in a four-team boys soccer event at Altoona’s Mansion Park on Saturday. But the Tigers came home without a win. Against Philipsburg-Osceola, East Juniata put 20 shots on goal but didn’t get any in — neither did the Mounties as the contest ended in a scoreless tie. State College proved to be too much for East Juniata, scoring four goals in the first half of a 6-0 victory over the Tigers. HALIFAX — Aaron Morder scored a pair of unassisted goals in the second half to break open a tie game and lead Greenwood to a 4-1 win over Halifax in Tri-Valley League boys soccer on Saturday. Halifax scored first but it was 1-1 at the break. Greenwood held the home team to three shots and one corner kick. Greenwood also won the JV game, 4-0. HALIFAX — Juniata’s strongest output came in the middle as Halifax took the Indians in straight sets in a Tri-Valley League volleyball match Saturday. The Wildcats won 3-0 (25-5, 25-14, 25-9). Janelle Apple and Hunter Johns each accumulated three digs for the Indians. Cathy Pacheco had the team’s lone ace. KUTZTOWN — Greenwood’s highest finisher was Rachel Peters, who was the 104th runner to cross the line in the Varsity Blue girls cross country race at Kutztown University Saturday. The Wildcats finished 28th out of 32 teams entered. 104, Rachel Peters, 23:30.30; 122, Keirsten Burch, 23:56.10; 131, Gabrielle Cameron, 24:16.00; 173, Renee Dubaich, 25:34.00; 186, Bayley Hess, 26:04.20.